FDA has so far not recommended suspension of RotaTeq use. The Vaccines and Related Biological Products Advisory Committee meets today, after which FDA will make further recommendations on the use of the licensed rotavirus vaccines in the United States. Members of a Food and Drug Administration advisory committee meeting Friday urged physicians to continue using both commercial rotavirus vaccines despite evidence that both carry trace contaminants from a harmless pig virus. The panel did not take a formal vote on a recommendation, but a majority of participants said they thought the benefits of the vaccine far outweigh any potential risk. An agency spokeswoman said it would make no immediate recommendation on the vaccines, but would act expeditiously to come to a decision. Finally, there are some good quotations from committee members in the article at Medscape Today. Few questions regarding trypsin, the suspected source of contamination: is it usually produced in-house by vaccine manufacturers or bought from external suppliers? If yes, are there many different ones? How widely is trypsin used in production of biologicals? Should we be checking other products that are manufactured using trypsin? I see that trypsin is used in baby food to help babies digest is better. Is it possible that porcine circovirus can be in this as well? Thank you. Nevermind. One of my friends told me that since it is cooked, the virus will be destroyed. You have to admit, this can not be kosher. It's not kosher in any sense of the word to have viral contaminants! Pork or otherwise, if you understand my meaning. A doctor who blogs on our blog collective raises a concern/speculation that recombination events might be an issue with this contamination of the vaccines. I initially took him to mean between rotavirus and PCV and suggested to him that rotavirus and PCV seemed unlikely to recombine. His reply was to say that he was really, in his words, “thinking more along the line of concomitant herpes or adenovirus infections (both dsDNA viruses and much more plausible suspects)”. I'm a computational (molecular) biologist, not a virologist, but I'd have thought it unlikely—? My ideas are too simplistic, reflecting my lack of any real depth in virology, so I'll spare you them, which I'm sure you'll be relieved to hear 🙂 I'd welcome virologists' comments on his concern (or speculation, if you read it that way). 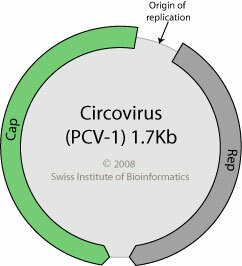 With viruses, nearly anything is possible, but if it is a rare event it will have no consequence. It is certainly possible that DNA of PCV and adenovirus or herpesvirus could recombine in cells, but the likelihood that such recombination would lead to an infectious virus is vanishingly small. But there are known examples of odd recombination. In one case, an RNA virus has been known to 'pick up' sequences from the host cell by recombination, leading to a more virulent virus. And I point you to this post which describes a possible recombinant between a DNA and an RNA virus: http://www.virology.ws/2010/04/26/a-plant-virus…. Because cells have reverse transcriptase, it's not impossible for an RNA viral genome to be converted to DNA and then recombine with other DNA present. Grant, I replied on the sciblog site you linked to, but it's not appearing. FWIW, I generalised my earlier comment at sciblogs. Most readers there are media and public, not scientists and I didn't want to make the argument too fiddly. (Ifs and buts look bad, etc.) I'm never sure if this is right way to go about it, but there you go.